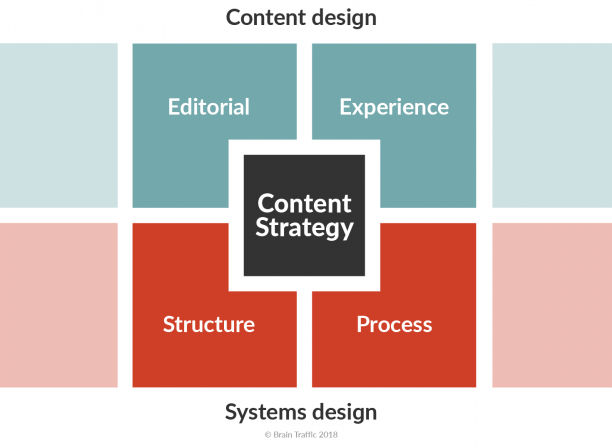 Content strategy can be described as a process. At the highest level, it entails planning, implementing, and administering the creation, distribution, and promotion of digital content. 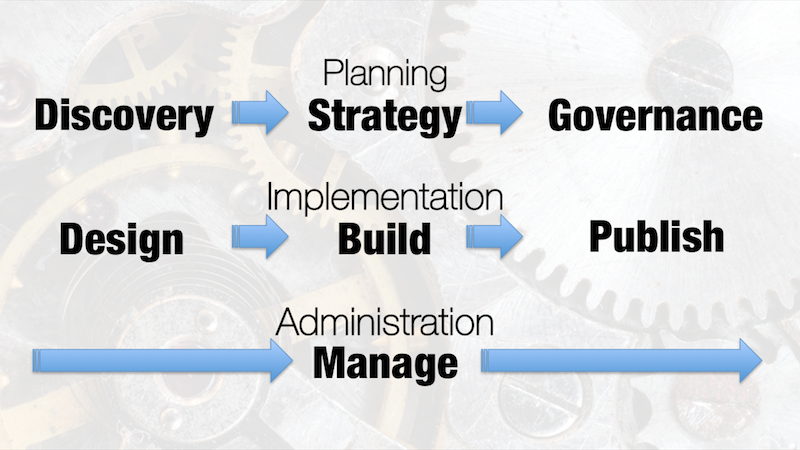 At a more detailed level, it entails stages familiar to any digital or business strategist: discovery, strategy, governance, designing, building, publishing, and management. At an even more detailed level, it can be described as a series of action steps, each of which results in a clear deliverable. The field of content strategy is fairly new, barely two decades old. It’s practiced by professionals from a range of digital business backgrounds, each of whom has a different description of the field. Some of these folks have set out models to describe how content strategy works. Most current models of content strategy are conceptual diagrams that show how the elements of the profession fit together. These diagrams and models are useful mostly to professional content strategists who are organizing and conducting their work. There are lifecycle models, pillar models, models from the UX field, higher-ed models, canvas models (derived from the famous business model canvas), and many others. The clearest and most-cited of these content-strategy models is Brain Traffic’s famous quad. Conceptual models like these can help you understand how content activities work together. Which is great – if you’re a content professional. But what if you’re a non-professional who still needs to do content strategy? Independent professionals, startup founders, solopreneurs, boutique web design and development agencies, and other small business owners all need content strategy. But they often lack the financial and operational wherewithal to hire a content strategist or to learn the profession. That’s what led me to create the DIY Content Strategy checklist. I have a ton of friends who fall into that non-content-strategy-expert category. I wanted to share with them an actionable content-strategy process that they could execute, even without expertise. Even if you are a professional, I hope that looking at content strategy this way helps you see the field in a new way. A list of activities like the DIY checklist is the simplest process model I can think of. So that’s what I put together first. Adding these details makes the intent and goals of each stage clearer. You can get an even better feel for how these activities all work together if you lay out the stages of content strategy in a diagram. Here’s a short explainer video I put together to elaborate on this model. 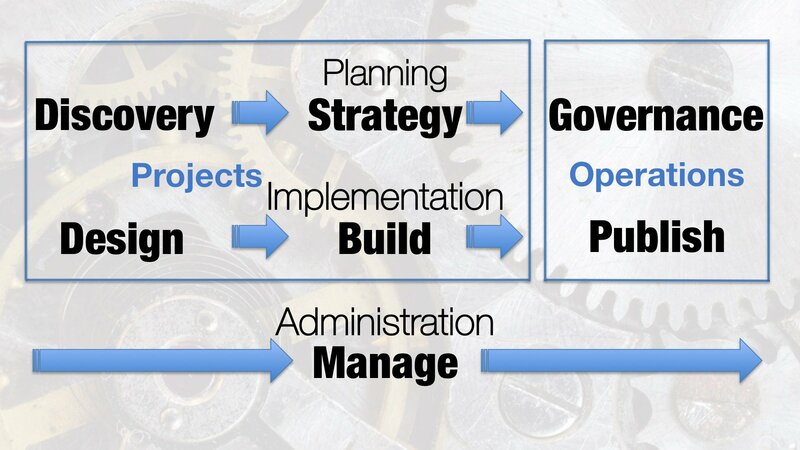 This slide from that video shows how the seven stages cluster into three phases: planning, implementation, and administration. The first two steps in the strategy and implementation phases typically unfold as projects, one-time efforts to discover and formulate your content plan and to design and build your content operation. For most ventures, the governance and publishing stages make up your ongoing, day-to-day content operations. And underlying everything is a management layer, which ensures that all of the tasks associated with planning and executing your content strategy actually happen. This model works best to describe content strategy in a small- to medium-sized business. These businesses typically operate at a scale and scope concerned mostly with publishing web content like websites, blogs, podcasts, videos, and social-media feeds. I suspect that the same activities happen in roughly the same sequence in other settings, albeit with more detail at each stage. In enterprises. In product content strategy. And in a content-strategy practice in a UX setting. But I don’t know enough about those areas to speculate on the applicability of this content-strategy model to them. This model is a work in progress. I’d love to hear what you think of it. Comments are open below, or you can connect with me via my contact page or on Twitter or LinkedIn.